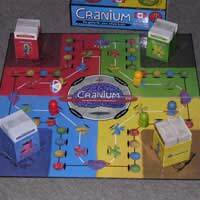 The board game Cranium has been around since 1998 making it fairly young as far as classic board games go. Its young age however is no reflection on the fun factor that can be had when playing. Since its inception, Cranium has fast become a massive hit, with spin-off games being released and a large following of fans enjoying the game regularly. The creators of Cranium (Whit Alexander and Rich Tait) suggest that Cranium is a game that uses your whole brain (thus the name one would assume). Playing Cranium involves various activities including logic, puzzle solving, creation, trivia and more. It is this great amalgamation of gameplay elements that mean the game of Cranium has something for everyone. Cranium is playable by four or more players (usually an even number). Players get into teams of two (or more – see variations) and choose who goes first, usually by whoever has the next birthday. Alternatively, the dice is rolled to see who goes first, though this is not the usual numbered dice, but a dice of colour panels, so for example the first person to roll red would go first. The board is set up and four different boxes of cards are placed in each of the four sections, these include Creative Cat (blue), Data Head (red), Word Worm (yellow) and Star Performer (green). Players (teams) advance around the colourful Cranium board with the overall aim being to get to the centre and thus win the game. Players advance clockwise in Cranium by landing on a space and choosing a card of the corresponding colour, completing the task on the card within the time limit and moving on. A team that completes the activity stated on the card correctly gets to roll again and this is the space they begin on the next turn (each turn only lasts for a total of one activity card per team). Rolling purple means they move to the next available Planet Cranium space. The Planet Cranium space is handy because a team successfully completing their task can then take the fast track, which means moving faster on fewer spaces than those on the regular track. Failure to succeed at the task when on a purple space means the team must continue along the regular course. Other gameplay factors within the structure of Cranium include the Club Cranium cards. If a card is drawn on anyone’s turn and it has a Club Cranium symbol on it, then all teams must take part in the activity. Clues such as sketches, sculptures and acting are shared amongst all teams and players guessing can use any or all players to gain them the answer. Whichever team wins the Club Cranium round gets to roll and move their playing piece, if you happened to be on a purple space ‘Planet Cranium’, you can move onto the fast track. Finishing Cranium sees a team make it to Cranium Central. This is the centre area of the board which looks like a large cartoon brain. To get to Cranium Central, the team must first do all activities on the black spaces at the centre of the board, again moving clockwise until all activities are achieved and they make it to Cranium Central itself. Once there the other team(s) choose an activity for your team, (usually one they think you are bad at) and you must complete this task to win the game. Winning this final task wins the game, failure means they will have another task chosen for them on their next turn and so on until they get the activity correct. There are many different facets to the Cranium board game and scoring in each of the differing main categories is dependent on specific tasks as outlined below. Creative Cat – This is the ‘artistic’ activity and will usually mean a player must draw or sculpt an answer for their team-mate. Creative Cat includes the activities of ‘Cloodle’ which sees the player draw the answer as in Pictionary. ‘Sensosketch’ sees the player draw with their eyes closed and finally ‘Sculptorades’ which asks the player to sculpt the answer out of the included play dough. No gestures as in charades, speaking, numbers or letters are allowed. Data Head – This is the ‘trivia’ activities and usually means a question and answer, multiple choice or true or false. Activities in this section include ‘Factoid’ which sees players conferring to answer a basic trivia question, ‘Polygraph’ which sees players answering a true or false statement and finally ‘Selectaquest’ which requires players to choose a response from four possible correct answers. Star Performer – As it would suggest, this is the performance part of the game. Sections include ‘Cameo’ which sees a player act out like charades, though no word counts and letters are allowed. ‘Copycat’ requires players to act as a famous person by imitating them in some manner without using names and ‘Humdinger’ sees the player hum a famous tune. Word Worm – language and spelling skills are what is important in this section. It includes ‘Blankout’ in which players must fill in the blanks of a word or phrase, ‘Gnilleps’ in which players must spell a word backwards out loud, ‘Lexicon’ players must choose the correct definition of a given word, ‘Spellbound’ one person out of the team is chosen to spell the word out loud and finally ‘Zelpus’ sees the players unscramble an anagram (clue given). Cranium VariantsThough the game itself doesn’t really feature any game-play variants, the popularity of Cranium since its launch in 1998 has meant numerous add-ons and spin offs. These include boxes of refresher cards with all sections getting new puzzle cards. Cadoo is a children’s version of the game (though it should be noted Cranium is fun for the whole family), Hullabaloo is a movement game, Zigity is a card game, played on plastic cards so you can even play it in the pool! Hoopla, yet another card game like Zigity only more based on Cranium. Bumparena sees players designing a board by using various pieces in the aim of getting a marble from one position to another.